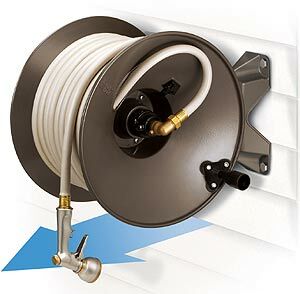 Tired of those cheap, awkward, infuriating, plastic hose reel systems that you are forced to buy, because there is no alternative? They should be advertised as disposable, because they are. You buy one in the spring and throw it away at the end of the season. They appear to be manufactured by Playskool. A very good, family owned business in Lincoln, Nebraska named Eley Corporation has brought to market a series of high quality garden hose reels made with heavy-duty aluminum, stainless steel and brass components. 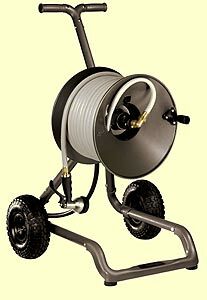 There are two wall-mount models, plus large reels mounted on two-wheel and four-wheel carts. Good design is evidenced throughout. The wall-mount plates feature holes drilled for standard sixteen-inch stud walls, the carts feature ten-inch, pneumatic tires, and all reels incorporate a unique braking system, brass fittings, and leak-proof design.